There are many ways to evaluate charities, but the true measure of any charity is their impact, whether they are meeting their mission and making a difference for the people they serve. NRC is — according to our customers. NRC is an intermediary service provider. This means our customers — the people we serve and directly impact through our work — are our reservation partners (aka Program Partners). Regardless of a Program Partner’s focus (nutrition, education, healthcare), NRC’s predominant goal is improving their programs and developing local leaders who can drive social change for the reservations. We measure this change through partner-focused outcomes. Our partners in turn work directly with community members on client-focused outcomes such as reducing hunger of disease rates. Our Program Logic Model is set up to illustrate the change for our reservation partners. The logic model shows that, as reservation partners become more effective, they are more likely to create positive impact for their communities. This moves us toward our vision of strong, self-sufficient Native American communities, and it underscores the need for NRC to maintain long-term relationships, high customer satisfaction and continuous feedback from our partners. Of course, there is a dual focus to our mission: Serving immediate needs, and supporting long-term solutions. So we track our long-term outcomes as well as the volume of output and immediate impact made by providing materials and supporting long-term projects. Learn more about NRC’s impact in our Annual Report and Program Effectiveness Report. Learn more about our program logic model in our Charting Impact report. We attribute much of our impact to working in reservation communities for 25 years, having knowledge of Native American history and cultures, maintaining long-term partnerships with reservation programs and working in a way that is respectful and aligned with the way our reservation partners work. Whether a reservation partner’s work involves immediate needs related to health, nutrition, education, holiday, community or emergency support, all of them are Material Services partners. So, we evaluate long-term impact for all of them in the same way. Annually, NRC sends an anonymous survey to our entire base of 1,000+ Program Partners to learn the gains they have made by working with us. Our annual survey response rate is higher than 50% and shows NRC has a positive impact on our partners and their ability to better serve their communities. 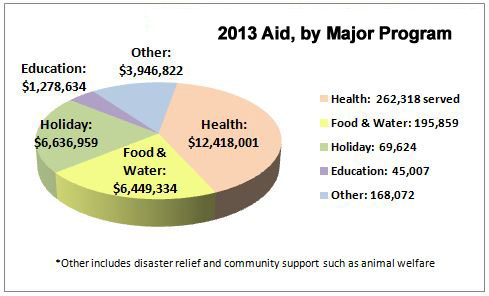 This next chart shows our volume of service or output for immediate needs in 2013. Through our Material Services partners, this aid benefited more than 250,000 Native Americans living in isolated and underserved communities with the highest rates of poverty in the United States. Material Services encompass all of our major programs and sub-brands (AIEF, AIRC, CIN, NAA, NRF, ROAR, SNRF and SWIRC). To learn more, see our Programs page and our 2013 form 990 (pages 45-56). National Relief Charities utilizes three types of services to support Long-Term Solutions and sustainable gains in reservation communities. Through Higher Education, our academic-year completion rate for students receiving our scholarships is 90-95%, considerably higher than the national average. NRC credits this success to our individualized mentorship program and our unique selection process of targeting students with a record of overcoming challenges. Through Capacity Building, the majority of our impact (4D) participants are using new skills within 3 months of the training. NRC tracks our training participant outcomes for a period of 3 years, so check back here for periodic updates on 4D results. Through Community Investment Projects, NRC supports community leaders who can drive social change on the reservations. NRC tracks these one-of-a-kind projects over a period of 3 years as they evolve toward sustainability and community impact. This chart shows the results of our 2014 Long-Term Solutions initiatives. Percent self-identifying goals and setting a development plan: Target: 75% | Actual: 100%. Percent using new skills within 3 months of training: Target: 65% | Actual: 100%. Percent reporting improving their reservation program due to 4D training: Target: 50% | Actual 100%. Percent networking with cohort/mentor 6-36 months after training: Target: 50% | Actual: 6-mo report due 09.15. This next chart shows the types of outputs and outcomes NRC will be tracking and reporting going forward for Long-Term Solutions. With the services now redesigned or being redesigned, it is these measures that will show how well we are developing community leaders and how to be sure regardless of the type of project.